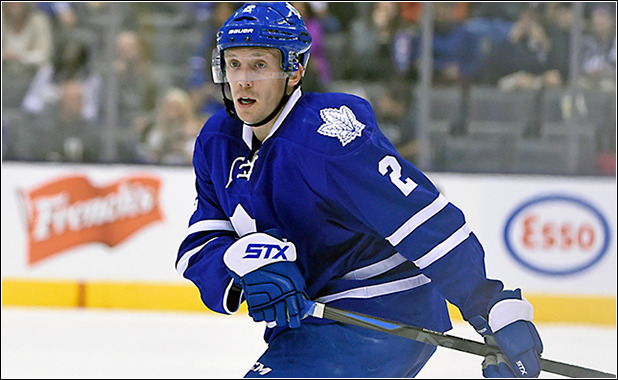 One of the Maple Leafs several depth pick-ups this past off-season, Matt Hunwick has begun to play an important role for the Maple Leafs. Now playing top pairing minutes with Morgan Rielly, his effects on the team are much more important than that of the depth defenseman he was brought in to be. At 21 games in, we've reached a point where we can start to analyze possession numbers to predict the fortunes of the franchise for the remainder of the season. So how has Matt Hunwick been doing? Truthfully, not as good as he should be. When he was brought in, Hunwick was sold as a bottom pairing defenseman who can help suppress shot attempts. That sounded perfect! These are the players the Leafs have lacked in recent years. For those who haven't seen this type of data before, here's what this means. 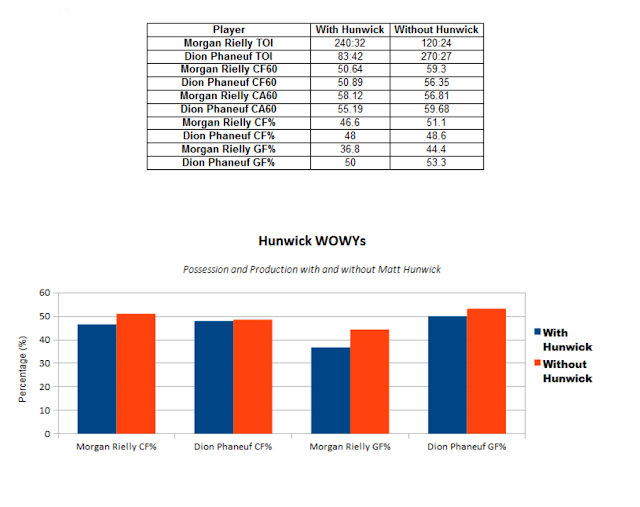 Both Morgan Rielly have had better possession (CF%) and production (GF%) without Matt Hunwick than with him. The blue bar, in all cases, is lower than the orange bar. This is not a good thing for Matt Hunwick. The first question we have to ask is why is this happening? Is Matt Hunwick bad? My answer to the latter is, in general, no. And, to the former, I have a few hypotheses. It's entirely possible that the cause of this is that, when Rielly and Phaneuf haven't been with Hunwick, they've been with Gardiner. We know, and have known for a long time, that Jake Gardiner is near-elite when it comes to possession metrics. Hunwick could very well just be a victim of not being as good as Jake Gardiner. We can't put all the blame on Gardiner being good. When looking deeper into the CF% and GF% WOWYs, you find the big shift is in Corsi For and Goals For. We knew coming in that Hunwick's strength was in shot suppression, and he has improved that area for Dion Phaneuf. Perhaps, while he's effective defensively, he's hindering the team offensively. We know he has 0 even strength points, his only assist coming on a powerplay goal (he gets, on average, 7 seconds per game of powerplay time, so I imagine this will be one of few PP points for Hunwick). Last season, Hunwick was a bottom pairing defenseman with the New York Rangers and had pretty good results that led to excitement that he was being brought in to Toronto. But he's been put into an entirely different role in Toronto as a top-pairing defenseman. Against Dallas, he and Morgan Rielly were steadily outplayed by the Seguin-Benn line (as most pairings are), and the same goes for the top lines of Pittsburgh, NYR, and Montreal. This could be for one of two reasons. Either Mike Babcock has a serious misunderstanding of what Matt Hunwick is, or he's being showcased for a trade. I want to believe it's the latter, but given that Hunwick is on a 2 year deal, he'll likely be back next season, and this makes me lean towards the former: Mike Babcock has been misusing Matt Hunwick. These 3 hypotheses can definitely co-exist in different amounts. It's impossible to say which of the three is the more driving factor. In the end, Hunwick has not been terrible, but we know for a fact that his partners have had better results without him, and that's something the Leafs should definitely keep their eye on. That's definitely a good point. I had only focused on Hunwick's stats here to keep myself within the scope of the article, so I didn't break down Rielly's numbers away from Hunwick.